As a student, my friends and I would role in from a nightclub at 3 am, make a stack of tea and toast and Marmite and watch the cult film Withnail and I. It told the tale of two luckless (frankly unemployable) actors, played by Paul McGann and Richard E Grant, as they drifted about between a squalid flat, the dole office and the pub. Leaving London for Penrith in the Lake District, they find the north is full of terrifying locals and lots of rain! It really is a fantastic film. When I saw Paul McGann was taking to the stage in Mold, I had to have a ticket. 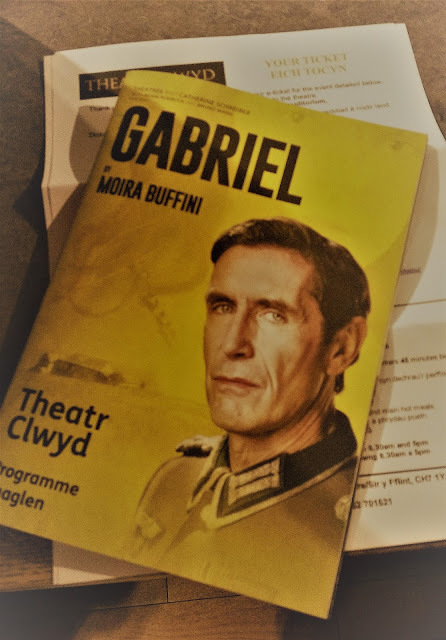 I didn’t know anything about the play Gabriel; but I knew this was a fantastic opportunity to see Paul on stage; there is nothing better than seeing an actor performing live. Gabriel is the story of a widow, Jeanne Becquet, living in 1943 Nazi-occupied Guernsey. Jeanne will do anything to ensure that her young daughter remains safe on an island filled with fear during the middle of WWII. The Becquet family home has been requisitioned by German officers, forcing them to move to an old farmhouse. The matriarch, Jeanne, is a widow with a son missing in action and she has an overly imaginative adolescent daughter Estelle. Add to the mix Jeanne’s Jewish daughter-in-law Lily, and you have an explosive mix of characters living together on this small island. Moira Buffini’s play has such a full and dramatic storyline, it would lend itself to a great radio drama. It is a play filled with moral dilemmas coupled with black humour; good v’s evil, the responsibilities of a mother in a war torn land and how far she should go to protect those around her, and, if necessary, who she should throw to the wolves. Jeanne, played with great acerbic wit by Belinda Lang (2.4 children) walks this tightrope of both collaborating with and resisting the Germans. She is selling food grown on her farm on the black market and she had previously had an affair with a German officer on the island. She is on the brink of having an affair with the replacement general; who she mistakenly believes cannot understand a word of English, when her Jewish daughter-in-law rescues a mysterious naked man from the beach. Jeanne is furious that this unconscious, unidentified man has been brought under her roof, although there is a disarming similarity in that he looks like her missing son. The man, once he regains consciousness speaks fluent English, but he has lost his memory, he even doesn’t recognise himself in the mirror. The plot takes an interesting twist, when the man they have named Gabriel, meets General Von Pfunz and speaks fluent German to him. The family is horrified. Who is this man, and whose side is he on? Paul McGann plays a very convincing Nazi general, Von Pfunz, from his realistic accent to his very pronounced mannerisms. He stands there at the start of the play smiling inanely and taking on all of the insults thrown at him by Jeanne who believes he can’t understand a word she says. It becomes obvious though that this is an educated man who is fluent in English and has witnessed many atrocities during the war. This is not a man to be messed with. He initially tricks the audience that Jeanne is the one with the upper hand, but it transpires he is playing cat and mouse with her. He is far shrewder than we have given him credit for, yet he still remains surprisingly human throughout. The play shows the unusual situation the islanders found themselves in. Harsh things were going on further afield in the war. Occupied France and Holland found the Germans meeting an active resistance, whereas on the Channel Islands there are photographs of German soldiers lying on the beach with locals. 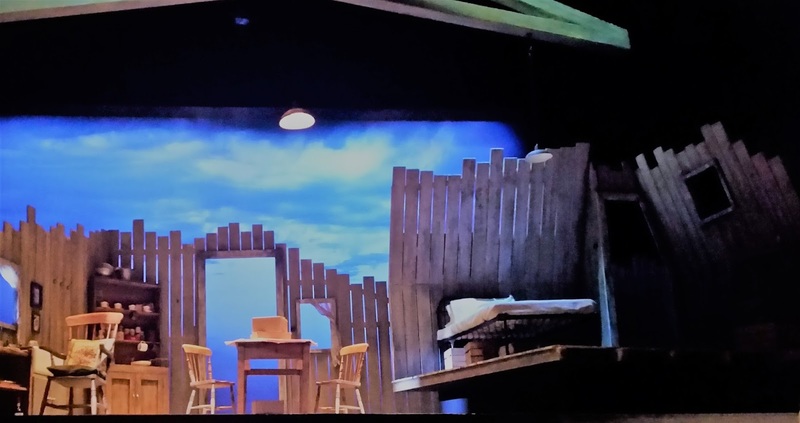 Whilst eventually there was a concentration camp on the island of Alderney, the play reflects the unusual atmosphere that the islanders were forced to face and tells a story of how to survive in such circumstances. By the end of the play we are left wondering, who is Gabriel? Was he a missing RAF pilot, a local boy with a brain tumour, or an SS interrogator? Did Estelle really summon the Angel Gabriel to bring salvation and hope to the family, or, was he simply just a Scapegoat? I have witnessed many great plays at Theatr Clwyd, but this was a real stand out moment. In this modern world it is difficult to comprehend that such horrors can happen in a human world. The matter of fact manner in which Von Pfunz writes his poetry about rooms full of hair (human hair from the Jews) that it is made into carpets is truly shocking. It is hard to comprehend that people could believe this was normal behaviour. In a world where we see so many frightful images on TV, we can become desensitised to what we see. We can’t believe what we are seeing, yet we know it goes on and is wrong. Hearing such poetic words describing such atrocities wakes you up and instils an anger that wrongdoings can and still do occur every day all over the world. Gabriel has spread its wings and left Theatr Clwyd, but you can catch up with it as the tour continues its run at Theatre Royal, Windsor, Berkshire.